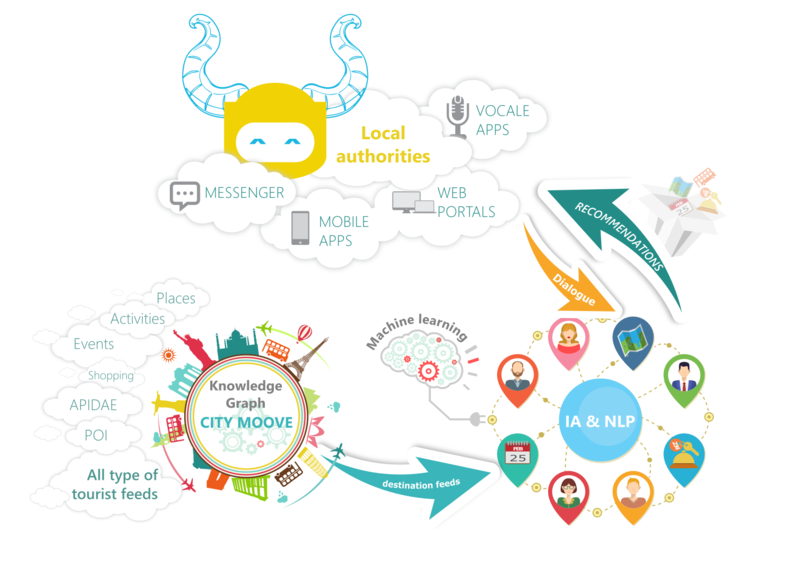 To summarize, City Moove is an innovative application that brings together all the tourist information available on a territory for its promotion. This solution, dedicated to local authorities and tourism companies, combines impressive amounts of data and provides real-time relevant information to allow visitors to better explore the tourist offer of a city. Several major tourist organizations already use the City Moove platform such as the Côte d’Azur (French Riviera) with the Comité Régional du Tourisme Côte d’Azur France or the island of Saint Barthélemy, famous for its high-end tourism, with the Territorial Tourism Committee of Saint Barthélemy. … This is where our companion MinoTour takes over. The interlocutor asks questions via media such as chat room, widgets, voice apps, mobile apps or interactive boards. Then, thanks to its natural understanding of the language (NLP module for “Natural Language Processessing”) and its artificial intelligence generated by algorithms and Machine Learning (… you always follow? ), MinoTour will detect the substance of the question, that is, the “intents” hidden in the sentence, to find answers in City Moove‘s Comprehensive Knowledge Base. That’s why MinoTour takes all its value and is not just a ChatBot like others! Some know more or less how to speak, but do not know where to find reliable sources of tourist information. Do you imagine a tourist guide who does not know his destination? … we neither ! Theme: Illdy. © Copyright 2018 Data Moove. All Rights Reserved.